Plant intercellular connections, the plasmodesmata (Pd), play central roles in plant physiology and plant-virus interactions. Critical to Pd transport are sorting signals that direct proteins to Pd. However, our knowledge about these sequences is still in its infancy. We describe a strategy to identify Pd localization signals in Pd-targeted proteins. Yuan, C., Lazarowitz, S. G., Citovsky, V. Identification of Plasmodesmal Localization Sequences in Proteins In Planta. J. Vis. Exp. (126), e55301, doi:10.3791/55301 (2017). Plasmodesmata (Pd) are cell-to-cell connections that function as gateways through which small and large molecules are transported between plant cells. Whereas Pd transport of small molecules, such as ions and water, is presumed to occur passively, cell-to-cell transport of biological macromolecules, such proteins, most likely occurs via an active mechanism that involves specific targeting signals on the transported molecule. The scarcity of identified plasmodesmata (Pd) localization signals (PLSs) has severely restricted the understanding of protein-sorting pathways involved in plant cell-to-cell macromolecular transport and communication. From a wealth of plant endogenous and viral proteins known to traffic through Pd, only three PLSs have been reported to date, all of them from endogenous plant proteins. Thus, it is important to develop a reliable and systematic experimental strategy to identify a functional PLS sequence, that is both necessary and sufficient for Pd targeting, directly in the living plant cells. Here, we describe one such strategy using as a paradigm the cell-to-cell movement protein (MP) of the Tobacco mosaic virus (TMV). These experiments, that identified and characterized the first plant viral PLS, can be adapted for discovery of PLS sequences in most Pd-targeted proteins. Plasmodesmata (Pd) function as conduits for intercellular transport of key regulators of plant development and morphogenesis, ranging from transcription factors to mRNA and small RNA molecules. Furthermore, this macromolecular transport capacity of Pd is utilized by most plant viruses for their intercellular spread during infection; to move through Pd, plant viruses have evolved specialized proteins, termed movement proteins (MPs), that specifically target to Pd1,2,3,4,5,6,7. Molecular pathways of Pd transport most likely are intimately interconnected with the specific sequences that target the transported proteins into these pathways. Thus, identification of these Pd localization signals (PLSs) may be diagnostic of the corresponding Pd transport pathway. This is by analogy of Pd transport8, for example, to different nuclear import pathways, which can be specific for different nuclear localization signal (NLS) sequences9,10. Conceptually, both NLSs and PLSs represent non-cleavable subcellular targeting sequences that are necessary and sufficient for targeting. However, unlike NLSs11, the sequence information about PLSs is severely limited. Specifically, only four protein sequences involved in Pd targeting have been reported, with all of them derived from endogenous plant proteins. The first one is represented by a homeobox domain of KN112 – a transcription factor that moves from inner cell layers to epidermis of the plant leaf13 – and its KNOX homologs14. The second one also is from a transcription factor, Dof, which contains a putative PLS described as the intercellular trafficking (IT) motif15. The third sequence is from the PDLP1 plasmodesmata-resident type 1 membrane protein, and it is represented by a transmembrane domain16. Finally, the fourth Pd targeting sequence was recently reported for glycosylphosphatidylinositol (GPI)-anchored proteins and it is represented by the glycosylphosphatidylinositol (GPI) modification signal17. Interestingly, until very recently, no PLSs have been reported for viral MPs. Previous studies indicated the presence of putative PLS sequences in plant viral MPs18,19, but no true PLS, i.e., a minimal amino acid sequence both necessary and sufficient for Pd targeting of an unrelated cargo molecule (e.g., CFP) has been identified in a viral MP. Yet one of these proteins, MP of the Tobacco mosaic virus (TMV), was the first for which Pd localization and transport have been demonstrated20. To address this gap, we developed an experimental strategy to identify TMV MP PLS. This strategy was based on three concepts. (i) We defined PLS as a minimal amino acid sequence that is both necessary and sufficient for protein targeting to Pd21. (ii) Because TMV MP first targets Pd and then translocates through these channels22, we aimed at uncoupling these two activities and identifying the bona fide PLS, which functions only for Pd targeting, and not for the subsequent transport. (iii) We analyzed the identified PLS for amino acid residues important for its Pd targeting activity, whether structurally or functionally. Using this approach, we delineated a 50-amino acid residue sequence at the amino-terminus of TMV MP that acts as bona fide PLS. 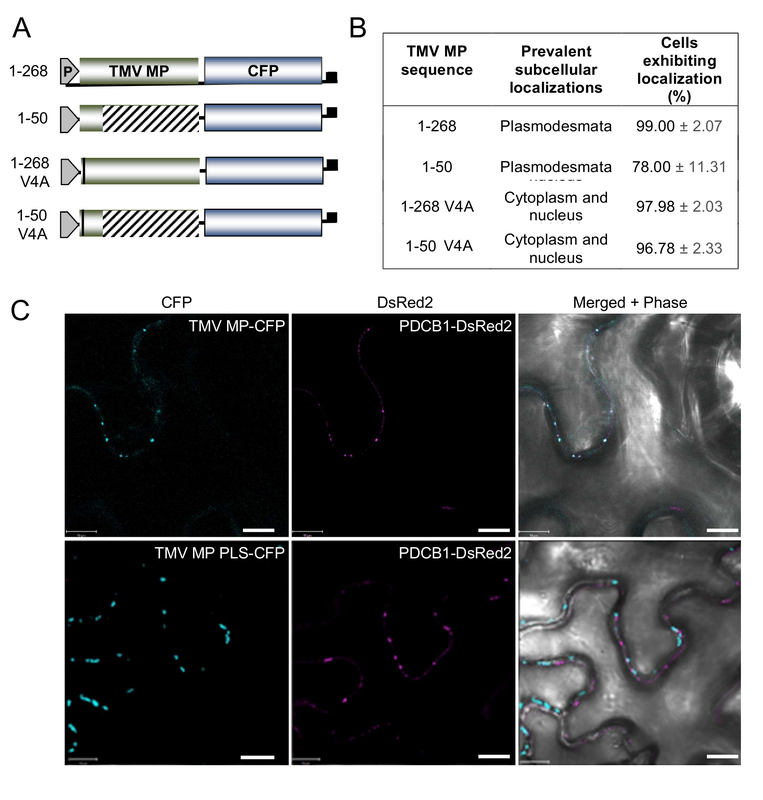 This was done by producing a series of TMV MP fragments that saturated the entire length of the protein, tagging their carboxyl-termini with CFP and transiently expressing them in plant tissues. Pd localization of each of the tested fragments was determined by coexpressing them with a Pd marker protein, PDCB1 (Pd callose binding protein 1)23. The smallest fragment that still localized to Pd, but did not traverse Pd, was considered to represent PLS. Finally, the PLS was alanine-scanned to determine the key amino acid residues required for its structure and/or function. Whereas here we illustrate this approach by describing identification of TMV MP PLS, it may be employed to discover PLSs in any other Pd-targeted proteins, whether encoded by plant pathogens or by the plants themselves; this is because our method does not take advantage of any unique features of viral MPs with regards to their ability to target to Pd. Use the plant species native to the protein of interest, i.e., one which encodes this protein for endogenous proteins or which represents the natural host for the pathogen for viral proteins. In addition, the selected plant species must be amenable to the chosen method of transient genetic transformation. NOTE: The studies routinely employ Nicotiana benthamiana, which represents a good host for TMV and is transformed efficiently by the Agrobacterium-mediated genetic transformation technique, i.e., agroinfiltration (see Step 3). N. benthamiana plants also are easily grown and have large leaves, which are easily inoculated by Agrobacterium and easily analyzed by confocal microscopy. Plant N. benthamiana seeds in wet soil at high density. Keep them in a controlled environment chamber at 20-25 ˚C under 16 h of light at ~75 µmol photons m-2 s-1 and 8 h of darkness. After the diameter of euphyll reaches 0.5 cm, carefully transfer the seedlings to larger pots and continue growth in the same chamber under the same conditions. Maintain the plants until they grow to 4-8-leaf stage within 4 weeks when the biggest leaves are 4-6 cm in diameter; at this time, they can be used for agroinfiltration (see Step 3). NOTE: Importantly, never use the plants if they began to flower because, at this developmental stage, the leaf architecture often varies24,25, sometimes leading to inconsistent results. Choose the expression system, i.e., vectors and vector delivery method, best suited for expression of the protein of interest in the plant species studied. NOTE: Occasionally, such specific combinations of tested protein/plant species may require specific vectors and vector delivery method for optimal expression and function of the protein of interest. For most dicotyledonous plants, however, select binary plasmids as expression vectors and agroinfiltration as delivery system. Fluorescently tag each expressed protein for analysis of its subcellular distribution22, including Pd localization. NOTE: Employ autofluorescent proteins, such as CFP and DsRed2, as tags. Tag the tested protein with CFP and coexpress it with a free DsRed2. CFP functions both as tag and as a virus-unrelated cargo molecule. DsRed2 functions to calibrate overall efficiency of transient expression and, because it is cell-autonomous, to identify the initially transformed cell; this latter function is important when assessing cell-to-cell movement of potentially non-cell-autonomous tested proteins. For coexpression with the Pd marker PDCB1, which also is cell-autonomous, tag the tested protein with CFP and PDCB1 with DsRed2. As a rule of thumb, fuse the autofluorescent tag to the carboxyl-terminus of the expressed protein. However, if the tagged full-length tested protein exhibits compromised Pd targeting, transfer the tag to the amino-terminus of the protein. Clone the coding sequences of the proteins to be tested into a suitable plant expression vector. NOTE: There are many different plant expression vectors that allow fluorescent tagging. We use a series of pSAT plasmids26 or some of their derivatives27,28, which are suitable for cloning of the sequence of interest directly in frame with the suggested autofluorescent tags (see Step 2.2.1) in both amino- and carboxyl-terminal orientations. Transfer each expression cassette into an Agrobacterium binary vector. NOTE: Although pSAT-based constructs are suitable for direct biolistic delivery into plant tissues, agroinfiltration, which is the transformation method recommended here (see Step 3), requires that the expression cassette to be located between the T-DNA borders of a binary vector29. NOTE: All pSAT vectors are designed to allow such transfer to the pPZP-RCS2 multigene expression binary vector26,30 by a single-step cloning using rare cutting nucleases AscI, I-PpoI, I-SceI, I-CeuI, PI-PspI and PI-TliI26. Researchers who prefer to utilize recombinatorial cloning, e.g., using heterologous lox sites31, can employ pSAT vector variants26,27. For coexpression, transfer both expression cassettes, e.g., tested protein-CFP and DsRed2 or tested protein-CFP and PDCB1-DsRed2 (see Step 2.1), to the same pPZP-RCS2 binary vector. NOTE: Alternatively, Agrobacterium cultures harboring individual binary constructs can be mixed together for infiltration into N. benthamiana (see Step 3.1). Add 1 µg of a pPZP-RCS2-based plasmid from Step 2.2.5 to 100 µL culture of competent cells of Agrobacterium tumefaciens strain EHA105 or GV3101 prepared as described32, incubate on ice for 30 min, flash-freeze in liquid nitrogen for 1 min, and incubate at 28 °C for 15 min. Then, add 1 mL of LB medium (10 g/L tryptone, 5 g/L yeast extract, and 10 g/L NaCl) to the competent cell mixture and incubate at 28 °C for 2 h. Spin down the cells at 3,000 × g for 1 min, re-suspend them in 0.2 mL of LB, and plate them on LB agar supplemented with appropriate antibiotics (e.g., 100 mg/L spectinomycin and 50 mg/L rifampicin for pPZP-RSC2-based vectors26,30). Grow at 28 °C for 48 h until individual colonies are visible. Pick and plate several individual colonies onto a fresh LB agar plate (see Step 3.1), grow at 28 °C for 48 h, and take a small amount of bacteria for analysis by colony PCR33 to confirm the presence of the specific binary constructs. Grow each Agrobacterium colony with the construct of interest overnight at 28 °C in 5 mL of LB medium supplemented with appropriate antibiotics (see Step 3.1.1). Centrifuge the cells at 3,000 × g, and re-suspend them to OD600=0.5 in agroinfiltration buffer (10 mM MgCl2, 10 mM MES (pH 5.6), 150 µM acetosyringone). Incubate for 2 h at room temperature. If using a mixture of binary plasmids rather than a single multigene expression plasmid for protein coexpression, mix the corresponding cell cultures at 1:1 v/v ratio before infiltration. Then incubate the cells at 28 °C for 2 h.
Load the inoculum into a 1 mL plastic syringe and press the nozzle of the syringe (no needle) against the lower (abaxial) epidermis of the fully mature N. benthamiana leaves. Hold the leaf with a gloved finger on the adaxial face34,35. Introduce the Agrobacterium in infiltration medium by slow injection. For statistical significance, infiltrate several leaves on each plant. NOTE: Note that the oldest leaves are not used as they do not yield consistent expression levels. Inoculate all leaves in situ. Maintain the infiltrated plant until observation as described in Step 1.2 . Use a blade to cut each leaf into fragments between the veins 24-48 h after the infiltration, (depending on the efficiency of transient expression of the specific tested protein); the size of each tissue slice should be such that the slice is completely covered by the cover glass (22 mm x 40 mm) used for microscopy. Place the leaf slices on the object slide with the abaxial leaf surface facing up, place a drop of water on the leaf slice and cover it with the cover glass. Immobilize the cover glass with small pieces of tape on each side. Observe the agroinfiltrated tissues under a laser scanning confocal microscope and record the resulting images. First, use a 10X objective lens to identify cells with the signal, and then use 63x objective lens for more detailed observations. Use the 458 nm wavelength from an argon ion laser to excite CFP, and 543 nm to excite DsRed2. Retain all settings for image acquisition, i.e., laser intensity and photomultiplier tube (PMT) settings, between experiments. On average, examine 100-120 cells for each experimental condition. Diagnose the localization of the tested protein using confocal microscope (section 4). Check if the tested protein has the characteristic peripheral punctate pattern25,36,37,38,39,40,41 and colocalizes with the Pd marker PDCB123. This indicates that the tested protein most likely contains PLS sequences. After confirmation of the PLS activity of tested protein, progressively subdivide its open reading frame (ORF) (genbank accession number BAF93925.1) into smaller fragments, autofluorescently, (e.g., CFP,) tag each of them, and analyze their subcellular localization as described in Step 4. Initially, the size of 100 amino acid residues for each subdivided fragment is recommended. Further subdivide the truncated fragments which have the PLS activity and check their subcellular localization as described in Step 4 until the smallest fragment that still localizes to Pd, i.e. is sufficient to transport the autofluorescent tag cargo to Pd, is identified. This fragment is presumed to represent the PLS sequence. Delete the putative PLS from the full-length tested protein, i.e. fuse the remaining part of the test protein without putative PLS to autofluorescent tag, and determine the subcellular localization of the resulting mutant protein as described in Step 4. If this mutant protein that lacks the putative PLS fails to localize to Pd, this will indicate that the identified PLS is not only sufficient (see Step 5.3), but also necessary for the Pd transport of the tested protein. Agroinfiltrate the leaves with a mixture of Agrobacterium cultures harboring the expression construct for the CFP-tagged PLS and free DsRed2 (see Step 3.3). Observe infiltrated tissue using confocal microscope with objective lens of 10x using the same settings as in Step 4.3. Score cells that contain both CFP and DsRed2 signals as initially infiltrated cells, and score the adjacent cells that contained only the CFP signal as those that exhibit movement. NOTE: This step examines the identified PLS for its potential cell-to-cell movement ability; this is because many proteins that target Pd (including most plant viral MPs) also move through Pd to the neighboring cells. The concentration of Agrobacterium used for infiltration depends on the expression efficiency of different structures respectively. For agroinfiltration, make sure to use the cell culture dilution that ensures (i) transformation of single cells, leaving the adjacent cells untransformed, (ii) achieves similar efficiency of expression. For example, our experiments utilize OD600 of 0.01 and 0.005 for expression of CFP-tagged PLS and free DsRed2, respectively. Use standard PCR protocols to amplify the PLS coding sequence employing a pair of primers designed to contain the desired mutation, i.e., substitution of the target amino acid residue with alanine, around the central region of each primer as described21. Carry out primer design and use the site-directed mutagenesis kit for site-directed mutagenesis according to the manufacturer's instructions. Purify the resulting PCR products using any standard DNA purification kit, and digest them at 37 °C with DpnI to eliminate the parental (i.e., non-mutated) methylated and hemimethylated DNA. Cool this down for 5 min at room temperature (not on ice). Then transform the mixture directly into E. coli competent cells43, and identify colonies with the desired mutant constructs as described in Step 3.2. Introduce the mutant constructs into the binary vector as described in Step 2.2.4, perform agroinfiltration as described in Step 3, and assess Pd targeting as described in Steps 4 and 5.1. The representative data, which faithfully illustrate the results expected from the described protocols and identify the TMV MP PLS, are adapted from Yuan et al.21. Figure 1A first summarizes major constructs expressing the full-length TMV MP (1-268), TMV MP PLS (comprising the first 50 amino acid residues of the protein, 1-50), and its alanine scanning V4A derivatives fused to CFP (generated as described in Steps 2.2, 5.2 and 6) whereas Figure 1B summarizes and quantifies the subcellular localization of these tagged proteins. Figure 1C illustrates the characteristic peripheral punctate Pd localization patterns observed for TMV MP-CFP and for TMV MP PLS-CFP as well as for the coexpressed Pd marker, PDCB1-DsRed2 (see Step 5.1). Figure 2A illustrates Pd targeting of TMV MP-CFP and for TMV MP PLS-CFP and nucleocytoplasmic distribution of coexpressed free DeRed2 (see Step 5.1). Finally, Figure 2B illustrates the loss of Pd targeting by both TMV MP and TMV MP PLS with a single alanine substitution V4A, indicating that this residue is important for the PLS structure or function; in the same cells the coexpressed Pd marker PDCB1 still localizes to Pd (see Step 6). These data show that this conceptually and technically simple procedure of systematic production of protein fragments, their fusion to an autofluorescent marker-cargo protein, and testing for the ability to localize to Pd can identify a minimal protein sequence necessary and sufficient for Pd targeting, i.e., PLS. 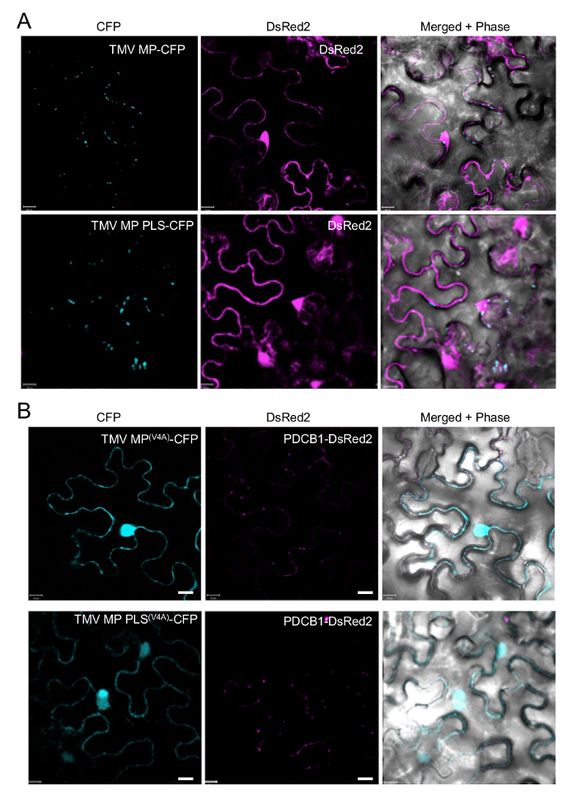 For correct interpretation of these localization data, it is critical to perform colocalization experiments with a known Pd protein, e.g., PDLP or PDCB family members16,23 or one of the plant viral MPs that sort to Pd44. Obviously, the colocalization does not have to be complete, as not all P-localizing proteins may be targeted to the same Pd, but a statistically significant degree of colocalization with at least one of Pd marker proteins is necessary for defining the PLS activity. Figure 1: Identification of TMV MP PLS. (A) Summary of main CFP-fusion constructs used to identify TMV MP PLS. TMV MP sequences, green boxes; CFP, blue boxes; P, promoter; T, terminator. Numbers on the left indicate the amino acid residues included in each TMV MP fragment. (B) Summary of subcellular localization of fusion proteins shown in (A). Pd localization or nucleocytoplasmic localization was determined based on the localization of the corresponding subcellular markers, PDCB1-DsRed2 and free DsRed2, respectively. The percentage of cells exhibiting each localization pattern is shown based on scoring 100 expressing cells per construct in three independent experiments. Data are mean ± standard errors (SE). (C) Pd targeting of TMV MP-CFP, TMV MP PLS-CFP, and the Pd marker PDCB1-DsRed2. CFP signal is in blue; DsRed2 signal is in purple; plastid autofluorescence was filtered out. Images are single confocal sections. Scale bars = 10 µm. DIC, Differential interference contrast micrograph. This figure is adapted from Yuan et al.21. Please click here to view a larger version of this figure. Figure 2: Pd targeting of TMV MP, TMV MP PLS and their alanine-scanning mutants. (A) Subcellular localization of TMV MP-CFP, TMV MP PLS-CFP, and the nucleocytoplasmic marker DsRed2. (B) Loss of Pd targeting ability of the V4A alanine-scanning mutants of TMV MP-CFP and TMV MP PLS-CFP. Pd were visualized by coexpression of the Pd marker PDCB1-DsRed2. CFP signal is in blue; DsRed2 signal is in purple; plastid autofluorescence was filtered out. Images are single confocal sections. Scale bars = 10 µm. DIC, Differential interference contrast micrograph. This figure is adapted from Yuan et al.21. Please click here to view a larger version of this figure. This protocol has four core constituents: the concept of identifying a sequence that is both necessary and sufficient for targeting to Pd, systematic division of the protein of interest into fragments that are progressively reduced in length, fusing the tested fragments to an autofluorescent protein that serves both as tag and as macromolecular cargo, and functional assay for Pd targeting in living plant tissues following transient expression of the tested fusion proteins. Note that Agrobacterium-mediated transient expression generates data within a relatively short period of time, i.e., several days, as compared to months required for production of transgenic plants often used in similar studies15. Coexpression of the protein of interest with subcellular localization markers, e.g., PDCB1 or free DsRed2, usually is performed from a multigene expression vector. However, if transfer of several expression cassettes into a single vector is technically problematic, coexpression can also be performed by transferring each cassette into a separate binary construct and combining equivalent volumes of liquid cultures of the resulting Agrobacterium strains for agroinfiltration. Because this protocol utilizes transient expression, the binary vector need not carry selection markers for stable transformation, although their presence is not detrimental to the expression efficiency. This protocol is optimized for protein expression and targeting in N. benthamiana; however, it can be used in other plant species, including Arabidopsis45,46, amenable to genetic transformation by Agrobacterium. For other plant species, or if otherwise desired, this protocol can be adapted to utilize biolistic delivery41 for transient expression directly from pSAT-based vectors, avoiding the need to transfer the expression cassettes to binary vectors. A critical point in this protocol is the consistent physiological and developmental condition of the plant material. Specifically, all plants must be healthy throughout the entire experiment, and, for agroinfiltration, the N. benthamiana plants must be less than 4-weeks old and at the 4-8-leaf stage with the largest leaf being 4-6 cm in diameter. If the plants are too young, the effects of agroinfiltration will be too severe, interfering with expression and localization of the tagged proteins. On the other hand, the older plants often exhibit variable architecture of Pd24,25, also affecting the consistency of Pd-targeting patterns. Still, due to varying physiological conditions of the plant as a whole, and of its transformed cells in particular, the efficiency of Pd targeting in each experiment may somewhat vary. Thus, it is important to analyze a relatively large number of cells (>100) per experiment, and perform at least three biological replicates of each experiment. Generally, we consider a tested fragment to contain Pd targeting activity, if it exhibits Pd localization in at least 70% of the transformed cells. Differences in Pd targeting efficiency of each fragment, e.g., percent of transformed cells showing the Pd-specific punctate accumulation pattern, should be analyzed by the Student's t-test, and p-values <0.05-0.01, corresponding to the statistical probability of greater than 95-99%. Another important issue is the position of the fluorescent tag/cargo in the fusion molecule. Some Pd-targeted proteins also associate with the endoplasmic reticulum (ER), and this association might require the unobstructed amino-terminal sequence. In these cases, amino-terminal fusions, in which the carboxyl-terminus of the protein fragment of interest is fused to the amino-terminus of the fluorescent tag, e.g., CFP or DsRed2, should be used. This default placement of the tag can be altered in the following cases. (i) If the amino-terminal fusions are not usable – i.e., they do not exhibit meaningful subcellular localization patterns, are poorly expressed, or do not generate fluorescent signal sufficient for reliable detection – and if the protein of interest does not contain amino-terminal signal sequences or carboxyl-terminal fusions in which the amino-terminus of the tested fragment is fused to the carboxyl-terminus of the tag, they should be attempted. (ii) The carboxyl-terminal fusions also should be used if the protein of interest contains signal sequences at its carboxyl-terminus. (iii) If the protein of interest has both amino- and carboxyl-terminal signals, such as those found in GPI-anchored proteins, or if it contains an amino-terminal signal peptide yet its amino-terminal fusion is not usable, the tag should be placed internally, (either downstream of the amino-terminal signal or upstream of the carboxyl-terminal signal). Some useful procedures for internal fluorescent tagging of proteins are described in our earlier publications47,48. At present, there is no known consensus sequence for PLS. As such (in step 5.2) we recommend, initially subdividing the protein into contiguous ~100-200 residue-long fragments. These can then be made progressively shorter based on the observed Pd-targeting activity or the lack thereof. One should be mindful of other potential targeting signals present in the protein (e.g., NLS, signal peptides, etc.). However, as the potential overlap of such sequences with PLS sequences is unknown, these protein regions should be included in this mutational analysis. So far, this protocol was used to identify a single PLS in a protein molecule21. Potentially, however, a protein can contain more than one signal sequence; indeed multiple NLSs have been described in many nuclear proteins, including GATA transcription factors49. Thus, when analyzing different fragments of the tested protein for Pd targeting, it is possible that more than one such fragment will be identified, indicating the presence of multiple PLSs which may act independently or synergistically. The main limitation of this protocol is that, following agroinfiltration, visualization of subcellular localization of transiently expressed proteins of interest is best achieved in epidermal cells and at relatively narrow growth stage. When necessary, this limitation can be overcome by producing transgenic plants that stably express each of the tested proteins in most of their tissues and cell types. Also, this protocol would not be useful for studies of viral MPs or other Pd-targeted proteins that function only in plants species that are not amenable to transient genetic transformation. While we developed this technique for identification of a PLS of TMV MP, it can be used for the discovery of PLSs in any other plant viral MPs or in plant endogenous proteins that localize to Pd, transiently or permanently. Furthermore, if combined with appropriate subcellular localization markers47, this protocol is suitable for identification of many other targeting signals within proteins of interest in plants. For the lack of space, we cited mostly review articles, and we apologize to our colleagues whose original work was not cited. The work in the V.C. laboratory is supported by grants from NIH, NSF, USDA/NIFA, BARD, and BSF to V.C., and the S.G.L. laboratory is supported by NIH and funds from the Departments of Plant Pathology and Plant-Microbe Biology to S.G.L. Lee, J. Y. Plasmodesmata: a signaling hub at the cellular boundary. Curr. Opin. Plant Biol. 27, 133-140 (2015). Kumar, D., Kumar, R., Hyun, T. K., Kim, J. Cell-to-cell movement of viruses via plasmodesmata. J. Plant Res. 128, 37-47 (2015). Kitagawa, M., Paultre, D., Rademaker, H. Intercellular communication via plasmodesmata. New Phytol. 205, 970-972 (2015). Jackson, D. Plasmodesmata spread their influence. F1000Prime Rep. 7, 25 (2015). Brunkard, J. O., Runkel, A. M., Zambryski, P. C. The cytosol must flow: intercellular transport through plasmodesmata. Curr. Opin. Cell Biol. 35, 13-20 (2015). Yadav, S. R., Yan, D., Sevilem, I., Helariutta, Y. Plasmodesmata-mediated intercellular signaling during plant growth and development. Front. Plant Sci. 5, 44 (2014). Sager, R., Lee, J. Y. Plasmodesmata in integrated cell signaling: insights from development and environmental signals and stresses. J. Exp. Bot. 65, 6337-6358 (2014). Jans, D. A., Xiao, C. Y., Lam, M. H. Nuclear targeting signal recognition: a key control point in nuclear transport? BioEssays. 22, 532-544 (2000). Miyamoto, Y., et al. Different modes of nuclear localization signal (NLS) recognition by three distinct classes of NLS receptors. J. Biol. Chem. 272, 26375-26381 (1997). Nair, R., Carter, P., Rost, B. NLSdb: database of nuclear localization signals. Nucleic Acids Res. 31, 397-399 (2003). Lee, J. Y., Yoo, B. C., Lucas, W. J. Parallels between nuclear-pore and plasmodesmal trafficking of information molecules. Planta. 210, 177-187 (2000). Kim, J. Y., Rim, Y., Wang, J., Jackson, D. A novel cell-to-cell trafficking assay indicates that the KNOX homeodomain is necessary and sufficient for intercellular protein and mRNA trafficking. Genes Dev. 19, 788-793 (2005). Lucas, W. J., et al. Selective trafficking of KNOTTED1 homeodomain protein and its mRNA through plasmodesmata. Science. 270, 1980-1983 (1995). Chen, H., Jackson, D., Kim, J. Y. Identification of evolutionarily conserved amino acid residues in homeodomain of KNOX proteins for intercellular trafficking. Plant Signal. Behav. 9, e28355 (2014). Chen, H., Ahmad, M., Rim, Y., Lucas, W. J., Kim, J. Y. Evolutionary and molecular analysis of Dof transcription factors identified a conserved motif for intercellular protein trafficking. New Phytol. 198, 1250-1260 (2013). Thomas, C. L., Bayer, E. M., Ritzenthaler, C., Fernandez-Calvino, L., Maule, A. J. Specific targeting of a plasmodesmal protein affecting cell-to-cell communication. PLOS Biol. 6, e7 (2008). Zavaliev, R., Dong, X., Epel, B. L. Glycosylphosphatidylinositol (GPI) modification serves as a primary plasmodesmal targeting signal. Plant Physiol. 172, 1061-1073 (2016). Sasaki, N., Park, J. W., Maule, A. J., Nelson, R. S. The cysteine-histidine-rich region of the movement protein of Cucumber mosaic virus contributes to plasmodesmal targeting, zinc binding and pathogenesis. Virology. 349, 396-408 (2006). Kaido, M., Funatsu, N., Tsuno, Y., Mise, K., Okuno, T. Viral cell-to-cell movement requires formation of cortical punctate structures containing Red clover necrotic mosaic virus movement protein. Virology. 413, 205-215 (2011). Creager, A. N. H., Scholthof, K. B. G., Citovsky, V., Scholthof, H. B. Tobacco mosaic virus: pioneering research for a century. Plant Cell. 11, 301-308 (1999). Yuan, C., Lazarowitz, S. G., Citovsky, V. Identification of a functional plasmodesmal localization signal in a plant viral cell-to-cell movement protein. mBio. 7, e02052-e02015 (2016). Ueki, S., Citovsky, V. To gate, or not to gate: regulatory mechanisms for intercellular protein transport and virus movement in plants. Mol. Plant. 4, 782-793 (2011). Simpson, C., Thomas, C. L., Findlay, K., Bayer, E., Maule, A. J. An Arabidopsis GPI-anchor plasmodesmal neck protein with callose binding activity and potential to regulate cell-to-cell trafficking. Plant Cell. 21, 581-594 (2009). Maule, A. J. Plasmodesmata: structure, function and biogenesis. Curr. Opin. Plant Biol. 11, 680-686 (2008). Roberts, I. M., et al. Dynamic changes in the frequency and architecture of plasmodesmata during the sink-source transition in tobacco leaves. Protoplasma. 218, 31-44 (2001). Tzfira, T., et al. pSAT vectors: a modular series of plasmids for fluorescent protein tagging and expression of multiple genes in plants. Plant Mol. Biol. 57, 503-516 (2005). Chakrabarty, R., et al. pSITE vectors for stable integration or transient expression of autofluorescent protein fusions in plants: probing Nicotiana benthamiana-virus interactions. Mol. Plant-Microbe Interact. 20, 740-750 (2007). Chung, S. M., Frankman, E. L., Tzfira, T. A versatile vector system for multiple gene expression in plants. Trends Plant Sci. 10, 357-361 (2005). Lee, L. Y., Gelvin, S. B. T-DNA binary vectors and systems. Plant Physiol. 146, 325-332 (2008). Goderis, I. J., et al. A set of modular plant transformation vectors allowing flexible insertion of up to six expression units. Plant Mol. Biol. 50, 17-27 (2002). Walhout, A. J., et al. GATEWAY recombinational cloning: application to the cloning of large numbers of open reading frames or ORFeomes. Methods Enzymol. 328, 575-592 (2000). Tzfira, T., et al. Transgenic Populus: a step-by-step protocol for its Agrobacterium-mediated transformation. Plant Mol. Biol. Rep. 15, (3), 219-235 (1997). Woodman, M. E., Savage, C. R., Arnold, W. K., Stevenson, B. Direct PCR of intact bacteria (colony PCR). Curr. Protoc. Microbiol. 42, (3D), 1-7 (2016). Kapila, J., De Rycke, R., Van Montagu, M., Angenon, G. An Agrobacterium-mediated transient gene expression system for intact leaves. Plant Sci. 101-108 (1997). Wroblewski, T., Tomczak, A., Michelmore, R. Optimization of Agrobacterium-mediated transient assays of gene expression in lettuce, tomato and Arabidopsis. Plant Biotechnol. J. 3, 259-273 (2005). Boyko, V., Ferralli, J., Ashby, J., Schellenbaum, P., Heinlein, M. Function of microtubules in intercellular transport of plant virus RNA. Nat. Cell Biol. 2, 826-832 (2000). Heinlein, M., Epel, B. L., Padgett, H. S., Beachy, R. N. Interaction of tobamovirus movement proteins with the plant cytoskeleton. Science. 270, 1983-1985 (1995). Oparka, K. J., Prior, D. A. M., Santa-Cruz, S., Padgett, H. S., Beachy, R. N. Gating of epidermal plasmodesmata is restricted to the leading edge of expanding infection sites of tobacco mosaic virus (TMV). Plant J. 12, 781-789 (1997). Crawford, K. M., Zambryski, P. C. Non-targeted and targeted protein movement through plasmodesmata in leaves in different developmental and physiological states. Plant Physiol. 125, 1802-1812 (2001). Kotlizky, G., et al. A dysfunctional movement protein of Tobacco mosaic virus interferes with targeting of wild-type movement protein to microtubules. Mol. Plant-Microbe Interact. 14, 895-904 (2001). Ueki, S., Lacroix, B., Krichevsky, A., Lazarowitz, S. G., Citovsky, V. Functional transient genetic transformation of Arabidopsis leaves by biolistic bombardment. Nat. Protoc. 4, 71-77 (2009). Giesman-Cookmeyer, D., Lommel, S. A. Alanine scanning mutagenesis of a plant virus movement protein identifies three functional domains. Plant Cell. 5, 973-982 (1993). Ausubel, F. M., et al. Current Protocols in Molecular Biology. Wiley-Interscience. New York. (1987). Waigmann, E., Ueki, S., Trutnyeva, K., Citovsky, V. The ins and outs of non-destructive cell-to-cell and systemic movement of plant viruses. Crit. Rev. Plant Sci. 23, 195-250 (2004). Lee, M. W., Yang, Y. Transient expression assay by agroinfiltration of leaves. Methods Mol. Biol. 323, 225-229 (2006). Burch-Smith, T. M., Schiff, M., Liu, Y., Dinesh-Kumar, S. P. Efficient virus-induced gene silencing in Arabidopsis. Plant Physiol. 142, 21-27 (2006). Tian, G. W., et al. High-throughput fluorescent tagging of full-length Arabidopsis gene products in planta. Plant Physiol. 135, 25-38 (2004). Tian, G. W., Chen, M. H., Zaltsman, A., Citovsky, V. A pollen-specific pectin methylesterase involved in pollen tube growth. Dev. Biol. 294, 83-91 (2006). Hunter, C. C., et al. Multiple nuclear localization signals mediate nuclear localization of the GATA transcription factor AreA. Eukaryot. Cell. 13, 527-538 (2014).